David Darling did nothing too original, when recorded this ethnic-based album, but he got more unique friends than his predecessors worked together with. At least i myself heard no collabs with Taiwanese people yet. Very gentle album, but not without a touch of "thru-the-lookin'-glass"-ness. It was re-released in 2004 by Riverboat Records as MUDANIN KATA - read about it here. Review: "The Wulu Bunun people of Taiwan specialize in a gloriously subdued style of harmony singing. In fact, their song "Pasibutbut" changed the way Western ethnomusicologists thought about the evolution of harmony. It's included here, a mystical, magical vocal prayer with a coda from David Darling's expressive cello. The vast majority of the pieces here intertwine voice and cello more closely, although there are solo cello pieces ("Wulu Dream" and "Wulu Mist") and pieces just for the singers. Recorded in a valley near the village of Bunun, it's cloaked in ambient natural sounds which blend perfectly alongside Darling's individual playing style and the voices of adults and children. The marriage is close to perfect as the styles complement each other, as on "Bunun Tuza," where Darling simply lets bowed notes hang under the voices. The harmonies themselves are exquisite and without thought, and obviously fire Darling's plentiful imagination. He never adds too much, just what's needed to color and enhance the singing, whether something simple like arpeggios, or even a single note, or decorating with harmonics. The parts themselves are impressive; together they make something wonderful, more than their sum. It may never receive the exposure it deserve, but it's a gem." 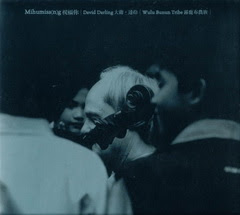 "This collaboration between the Wulu Bunun - amateur vocalists from the Taiwanese region of Wulu - and cellist David Darling is no average "world music" project. While albums like Buena Vista Social Club or Ry Cooder's duets with Malian guitarist Ali Farka Toure have the polish and overall sound of contemporary North American music, Mudanin Kata is comparatively unadorned, maintaining a somewhat indigenous and "nanve" sound. The Wulu Bunun consist of both children and adults, and their unusual choral sound may remind some Western listeners of gospel, field hollers, and campfire sing-alongs. The harmonies, though, are utterly distinctive. Darling's cello joins the Wulu Bunun in an unobtrusive manner, adding bowed backing or simple, repeating figures, or arpeggios in a way that blends naturally with the group's performance. Though there are a couple solo spots for both cello and group singing, the majority of the album consists of these delicatelybalanced duets. The performances were captured in a valley near Bunun, so the recordings have a wide, open-air feel to them that perfectly complements the organic, soul-stirring music."